My mother is in town for Thanksgiving and with her she brought me something really special. A quilt top from my family. Though my mother had it, it is from my father's side of the family. My great aunt didn't know who had made it (she though her grandmother or great aunt), so it's from many generations ago. Apparently there are more and I'm going to be getting them over time. 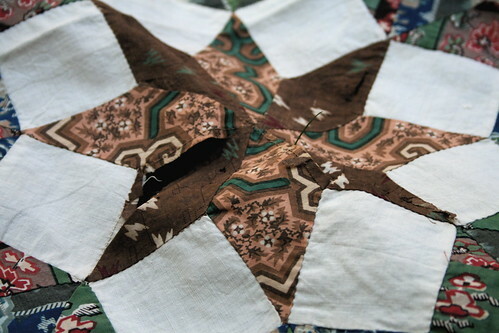 Needless to say, with the role quilting plays in my life, this is incredibly meaningful for me. See those half blocks along one edge of it? Anyone know exactly what those are for? My mother was saying she thinks it had to do with how the quilt would be arranged with pillows on a bed. It's got some really great fabrics in it. And it needs a little bit of repair. 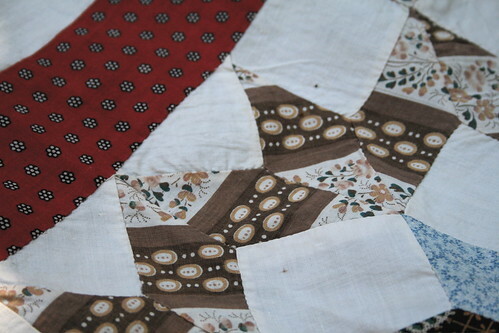 I think that repairing and then finishing this quilt is a project I'm going to tackle. If anyone has done anything like this before, please let me know any tips or tricks you have. 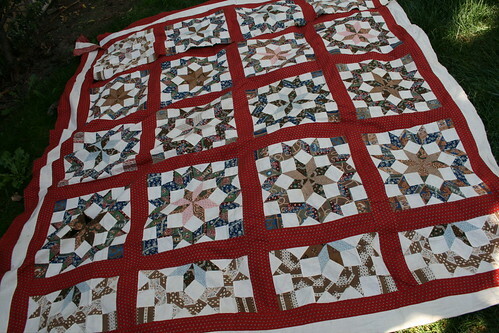 I've never quilted anything by hand before, but I think this is the project that will make me do it. It's so wonderful to think that I'll sit and handstitch this project just like my family did before me. Hope that you all have wonderful Thanksgivings!! I'm so thankful for all of you and all this blog has brought me so thank you! !